The insurance policies are gaining wide acceptance nowadays. People find it easier to save a heavy amount of money through insurance policies. Insurance policies cover all the desired aspects that one can take benefit from. The basic four insurance parameters are life insurance, health insurance, property insurance, and auto insurance. These four parameters are almost necessary in today’s world. Insurance policies need to be much persuasive and thoughtful towards the insured. People desire to work hard throughout their whole life to create a big financial backup for their family. The insurance policy helps greatly to protect valuable possessions for the beloved ones. The insurance plans are applied based on employment pattern of the insured. Some organizations provide their own insurance plans while others merge with top insurance companies to provide different policies to their employees. Individuals like to opt for those insurance plans that are tranquil and time-saving. The insurance plan package must be designed in a way that it meets the instant needs of the user in easy steps. Moreover, the government organizations are revered with some value-added insurance packages. The insurance proposal letters are sent to the respective clients by the respective insurance companies. It is prepared by covering all the desired parameters of insurance a client can opt for. These all insurance packages are provided with details and specifications. The cost and benefit analysis are also mentioned regarding the type of insurance package. It brings ease for the client to make a good choice. Insurance is a very commonly used concept these days. And due to its popularity, insurance companies and agents have become very notorious. An insurance proposal is a document prepared by the insurance company for its customers. The customer can be an individual or a company itself. An insurance document covers areas such as insurance coverage and its benefits. Insurance has expanded into various branches such as health insurance, business insurance, travel insurance and what not. This means, every customer will have a unique need and the proposal should cater the specific need. An insurance proposal will include the insurance packages and the solutions it can offer. 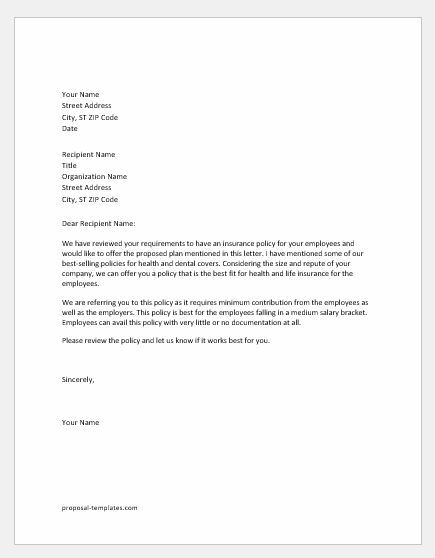 We have reviewed your requirements to have an insurance policy for your employees and would like to offer the proposed plan mentioned in this letter. I have mentioned some of our best-selling policies for health and dental covers. Considering the size and repute of your company, we can offer you a policy that is the best fit for health and life insurance for the employees. We are referring you to this policy as it requires a minimum contribution from the employees as well as the employers. This policy is best for the employees falling in a medium salary bracket. Employees can avail this policy with very little or no documentation at all. Please review the policy and let us know if it works best for you.